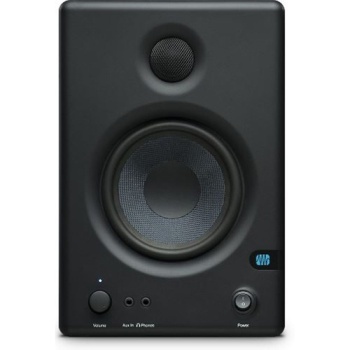 Musician's Workshop - PreSonus Erise 45 Studio Mon 2x 4.5"
If space is at a premium, or if you want the ultimate in portability, consider the ultra-compact Eris E4.5. It may be the size of a computer speaker, but this mighty mite delivers professional audio quality, thanks to a 4.5-inch, Kevlar low-frequency driver; a low-mass, 1 inch, silk-dome tweeter with protective grille; and Class AB amplification. Each speaker is powered by a 25W Class AB amplifier providing plenty of juice for a small speaker. The E4.5 ranges from 70 Hz up to 20 kHz, and at 6.42 x 9.45 x 7.09 inches (163 x 241 x 180 mm), you can shoehorn this little beauty into almost any studio space.